The LMB Biological Services Group (BSG) maintains state-of-the-art facilities to house breeding and experimental colonies of rodents. They aim to provide the highest standard of modern transgenic production services and experimental resources to support the current and future scientific programmes of the LMB and other MRC Units in Cambridge. The BSG is composed of approximately 70 staff, the majority of which are animal technicians. Junior animal technicians begin their careers with the MRC at Band 6 level, where they are responsible for the day-to-day husbandry of animals. They often progress, after training, to become Home Office licenced technicians who can conduct regulated procedures for LMB researchers. 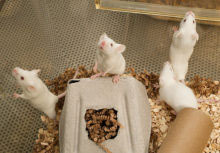 Progression to Band 5 level can either be achieved by becoming a supervisor in charge of a mouse breeding room, with a team of 3 to 4 Band 6 technicians, or by becoming a specialised experimental technician. Band 4 managers are responsible for discrete areas within the facility (e.g. the breeding unit, quarantine, services, transgenic production).